In keeping with our listing of 1967 generally, here are the new Patch outfits that were listed in the 1967-1968 Tri-ang Bumper Book of Toys. Patch was given some wonderful outfits, many of which are highly collectible today. Both 'Blouse' and “Casual Skirt' are depicted in this brochure together with prices, but without a description, so we are unsure that they were actually released in 1967, particularly as they are not shown in the 1968 style leaflet. However, the Patch Separates references do run in sequence so we have included them for the sake of completeness because we know that they must have been available at some point. We would be very pleased to hear from anyone who has any more information on them. This is another wonderfully detailed outfit for Patch, her authentic Brownies uniform. It consisted of a brown long-sleeved cotton dress with a collar and two breast pockets with flaps which fastened at the back with a black painted metal popper. The dress bore the usual badges that Brownies so loved to collect and wear. On her left arm “1st Merton” was printed in green and she had three triangle interest badges printed in yellow on her right arm. Above her left pocket was what looks like “Girl Guides” printed in yellow and above her right breast pocket her Six badge which we think is the green pixie. There was a brown plastic belt with a gold metal buckle and a yellow brownie tie which fastened at the back of the neck with a brass coloured metal popper. The tie was embellished with her Brownie Membership Pin, a little gold coloured metal dancing brownie. She wore matching brown knickers, white nylon socks and brown Mary Jane shoes. She had a brown wool felt beret that she couldn't manage to keep on straight and a whistle on a string that she liked to blow. A sweet little outfit, comprising a sleeveless red and white polka dot dress trimmed with red binding to the neck and arm holes. It fastened at the back with two white painted metal poppers. It was worn with a pretty white cotton broderie anglais trimmed half apron which tied at the back with cotton ties (the material was the same as that used for Sindy's 1966 'Bridesmaid' outfit). On top, Patch wore a scarlet cotton hooded cape, elasticated around the hood and tied with red satin grosgrain ribbon at the neck. She carried a basket of fruit and a book which had the same picture as her original 'Bedtime' book but this one is called “Nursery Rhyme Patch”. On her feet she wore little red shoes with moulded bows. There is a rare variation to this outfit, this version shown in the photo on the right. The variation dress has an original Patch label and it has much larger spots on the dress but with the same trim and fastenings. The variation cotton apron has cut out detail which is neatly embroidered. It has the same cape which is elasticated around the hood. The original 1967 description says that Patch said “What big eyes you've got Grandma!” to Paul, the 1968 leaflet was subsequently revised so that she said this to Sindy instead. A dark blue stretch nylon bathing suit which came with a lime green towel, brown one strap sandals and a little red elasticated hairband to keep her hair tidy. The towel had a red, blue, green and white multi-coloured wool fringe sewn on with a black thread overstitch. To keep afloat Patch had green and yellow vinyl blow-up water wings which tied around her waist with white tape. Out of school, Patch was given a pleated tartan woven cotton skirt with a red waistband that fastened with a red painted metal popper, and a red cotton jersey ribbed polo-neck sweater which also fastened with a red painted metal popper. On top she wore a smart grey felt wool blazer with a collar and patch pockets with matching red saddle-stitch detailing around the edges of the blazer, collar, sleeves and two pockets; it fastened with one red painted metal popper on her chest. She wore white nylon long socks and black square-toed shoes. To keep her amused, she was given a white kitten playing with a blue ball. There is a variation, shown in the photo on the right. It has the same jumper, the same jacket but made of a much lighter grey felt (it has a sewn in label) and the skirt is different tartan. This outfit was also issued later on with Poppet (without the kitten). A zip-front cotton jacket in navy, it had long elasticated sleeves and a hood lined in red with a matching red stripe around the waist. It was worn with red cotton jersey tights, little blue wellington boots, and a pair of white felt mittens with red stitching. She was given a little brown plastic toboggan “to zoom Patch around the slopes”. A matching brown knitted jumper and brown linen culotte-shorts are the basis of this outfit. The jumper is made of knitted cotton, with a yellow V-neck trim fastened by a black painted metal popper. The shorts are fastened by one black painted metal popper. Under her jumper, Patch wore a white round necked fine-ribbed cotton T-shirt which fastened with one white painted metal popper at the back of the neck. To match the yellow trim on her jumper, there was a yellow cotton flat woven girdle to tie around her waist and yellow cotton socks with a fine honeycomb pattern. She was given a wonderfully detailed plastic hockey stick with a blue coloured plastic handle with raised white plastic to look like the tape and a hockey ball described as “Patch's weapons against the opposing team”. This outfit did not come with shoes but could be worn with her school shoes. Two pretty separates for patch that were often teamed together. Blouse - a pretty white cotton, long-sleeved blouse trimmed with white nylon lace round the neck, cuffs and providing for a frill down the front. It fastened at the back with one white painted metal popper. Casual Skirt - a cotton, turquoise blue, block print A-line skirt with a single pleat at the front. It fastened with one flat black painted metal popper. 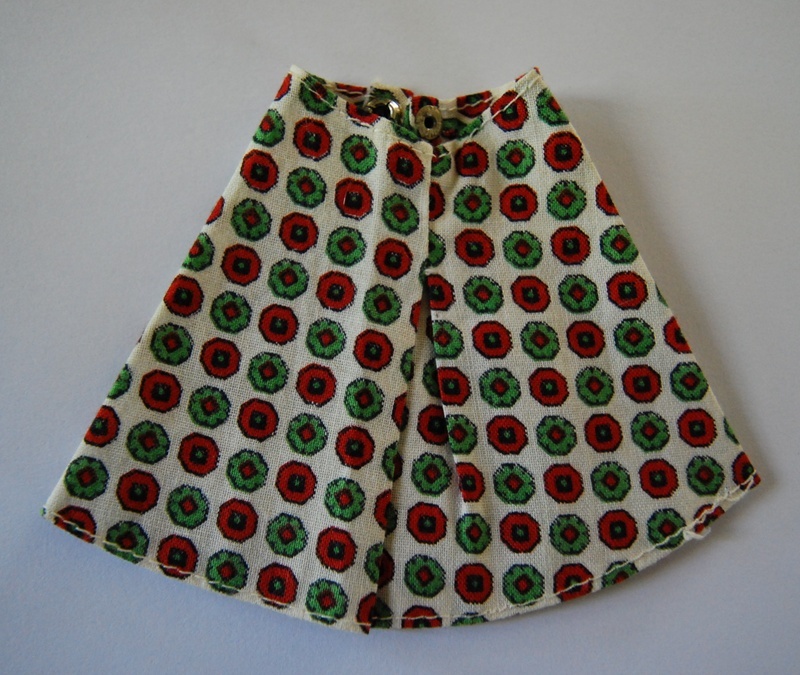 The inset photo on the right shows a variation of this skirt in white with a red, black and green block print. We would be pleased to know if there are any others. A cotton blue and white gingham smock dress with three-quarter length sleeves with elasticated cuffs and which fastened at the back with two white metal painted poppers. The dress had a single patch pocket on the left, it was trimmed with white nylon lace at the neck, and the smocking was a contrasting red thread. Here it is shown with 'Red Tights'. A pair of red tights with an elasticated waist. In the 1967 Tri-ang brochure, these tights were described as being made of red stretch nylon. However, in the 1968 style leaflet these tights were described as being red stretch cotton. We have not found any nylon versions and the red cotton is the same as the material used for Sindy's 'Skating Girl' outfit. A red felt, round-necked, sleeveless pinafore dress. It had a single patch pocket on the left and was styled with white stitch detailing around the neck, armholes, pocket and hem. It fastened at the back with a red painted metal popper. Worn in this photo with 'Easy Life'.